In spite of the fact that the mix looked so promising, the results of my own venture into making a homemade version were not particularly exciting. The brownies were excellent, of course, but the sprinkles didn’t add the same sort of festive look that they lend to funfetti cupcakes. I mixed rainbow sprinkles into the batter of one of my best brownie recipesÂ and discovered that it was difficult to see them even before baking because of the dark color of the batter. I added in about 1/3 cup of mini chocolate chips to hedge my bets and make sure the brownies had at least a little something extra special going for them andÂ scattered some more sprinkles on top for good measure before baking. The resulting brownies looked cute, but were not otherwise exciting. I didn’t get the same warm-and-fuzzy feeling that I have had from funfetti cupcakes. 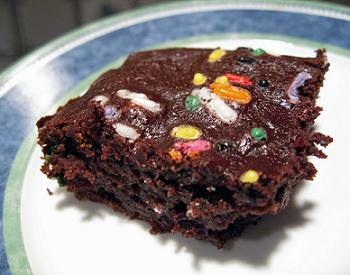 In the future, I’llÂ leave the funfetti to something with a lighter colored batter, but if you want toÂ try this yourself, simply stir in 2 tbsp rainbow sprinkles and 1/3 cup mini chocolate chips to the batter of your favorite brownie recipe, add some sprinkles on top, and bake as usual. I can’t find these in the UK. I am also not one to buy ready mix but i read about good mixes and I think ‘Why not? How about using some of the “Mini” baking M&Ms instead? The reason your funfetti looks weird is because the actual brownie mix does not use sprinkles for the “funfetti” part! They’re candy coated miniature chocolate chips. they’re much bigger than sprinkles, the candy coating is brighter, and they don’t blend in at all. You could try the mini M&M’s instead, or some sort of candy coated baking bits, if you want accurate results.